Archive for tag "Jan Michael Hess"
Ecosummit TV: At ECO15 London, we did a very informative and lively panel about growing and fundraising for late stage startups. The experts on stage include Felix Grolman (Grundgrün), William Weil (Ludgate), Gerard Reid (Alexa Capital) and Martin Kröner (Munich Venture Partners). In the meantime, a lot has happened: Gerard raised $50M for Younicos from First Solar, Panasonic and Grupo ECOS. Bill left Ludgate and joined Greencoat Capital, the CVC of the Irish utility ESB. Felix sold the direct marketing business of Grundgrün to EnBW and Martin invested in Cobi while Kebony raised €19M from PMV, Investinor and existing shareholders. It turns out that fundraising for late stage startups takes a lot of time and needs to be done globally to attract the best strategic investors for the growth strategy of the startup. At the same time, late stage startups need to hire the best management team to manage their growth. In Europe, family offices and corporates increasingly play a leading role in late stage investing and helping European startups become global market leaders. Ecosummit TV: We need more smart green angels in Europe. At the same time, angels should get better at co-investing in smart green startups and creating value during the holding period. With this motivation Christian Reitberger and Jan Michael Hess chat about the art of smart green angel investing at ECO15 Berlin. Christian is a VC and angel at the same time. This double role is possible as Wellington Partners stopped doing new investments in resource efficiency and, as a result, there is no conflict of interest. While many angels stay in the background, Christian gets a lot of dealflow because there is a general shortage of early stage investors and many people just know him. During the last years, he made 12 angel investments including 1 exit and 1 write-off. His active portfolio contains Romo Wind and Electrochaea. 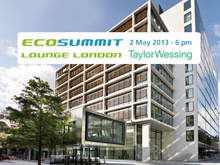 Ecosummit TV: We are very happy to announce our 9th conference Ecosummit Berlin 2015 taking place on 19-20 May 2015 at the Radialsystem – the best event location in Europe’s leading smart green city for startups. 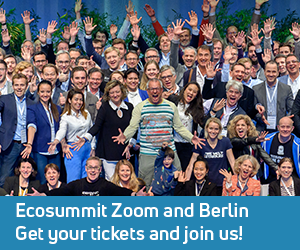 As a warm up, we share the opening of ECO14 Berlin on Ecosummit TV. Last year, the theme of Ecosummit was Accelerating Smart Green Startups. We believe that everybody should think and act like an accelerator trying to reduce capital and time to market while growing the team and revenues faster. This is what our industry needs: Faster startups and bigger exits. While a fast and small exit that results in an aquihire for the buyer may be a good thing, what VCs and LPs really want are big exits by big startups that have big economic and ecological impact. To make big exits happen, founders and their investors have to constantly work on the 4 success factors of startups: People, capital, product and customers. Only if you have the best team, enough capital, a competitive product and lots of happy customers, you are able to become a global market leader. At ECO15 Berlin on 19-20 May 2015, we will continue to work together on accelerating smart green startups aiming at big exits. Ecosummit TV: Ecosummit TV moderator Anna Yukiko Bickenbach interviews happy participants at Ecosummit Berlin 2014 – our fifth Ecosummit in Berlin that took place on 3-4 June at the one and only Radialsystem. This Ecosummit TV video features Hans Maenhout (Finindus), Alexander Bigge Lidgren (Swedish Energy Agency), Robert Czaja (Tesla), Gina Domanig (Emerald Technology Ventures), Christian Huder (Freelance Consultant), Alexander van Os (Yellow&Blue), Nils Aldag (Sunfire), Jay Marathe (Cartagena Capital), Björn Petersson (Ecosummit Ambassador), Eva Bjorseth (Oceanshore Ventures), Andriy Shmyhelskyy (CareToSave) and Jan Michael Hess (Ecosummit). 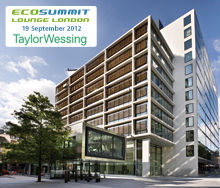 We look forward to hosting our next smart green innovation conference Ecosummit London 2014 on 7-8 October at the Crystal. Come and join us. Ecosummit TV: Our mobile Ecosummit TV studio stops again at CeBIT Code_n 2013 for more smart green startup interviews. This time, Jan interviews the Berlin-based founders Anna Yukiko Bickenbach of Ecotastic and Philipp Pausder of FutureWatt. Ecotastic is a new green marketing service provider that runs a reward system to foster green consumer behaviour. Consumers document their green actions with their smartphone and are rewarded with gift certificates from partner companies. Ecosummit TV: Europeans don’t think big enough. Michael Linse (KPCB), Pascal Mauberger (McPhy Energy), Oliver Stahl (Entelios) and Bart Markus (Wellington) discuss the differences between the cleantech startup and VC business in USA and Europe. There are many things we can learn from each other. On average, US cleantech startups get 4 times more capital than European ones. This has to do with the different environment in terms of market size, capital availability and competition.